The SEC has only lost one (Vanderbilt to Georgia Tech) since opening weekend. Five of its 7 losses were against Power-5 opponents. Only the Mississippi St. upset at the hands of South Alabama and Kentucky’s loss to Southern Miss were not to that group. The Big Ten still has a higher overall average winning percentage, but it has faced twice as many FCS opponents, two of which were victorious. Also, although there are many Power-5 wins, they’re often not against quality opponents. Four of the wins were Duke, Iowa St., Oregon St., and Colorado. In the SEC, on the other hand, four of the five wins against the Power-5 were against teams that were ranked in the preseason. 78% and 75% aren’t far enough apart to overcome the strength of schedule disparity, so I’d give the SEC a slight edge at this point, but it will depend on some future games, and the SEC will have more of them. For #3, I’m going to go with the ACC. They played five SEC opponents as well as Oklahoma St. and Oregon. The Pac-12 has similar records against slightly worse teams. The Big XII is only 15-11 right now. The best wins were over Notre Dame and Pitt. Not only would I put them last among the Power-5, I would also argue the American (AAC) should go ahead. The bottom tier of conferences is harder to rank. I would say the MAC and MWC are roughly even. The MAC would be ahead if it weren’t for the three FCS losses. The Sun Belt is a little better than CUSA. Mississippi St. is a better key win than Kentucky, and Southern Miss and Ohio are better than Bowling Green and Miami U. There are a few major inter-conference games this weekend. I already covered the SEC games. I’ll address the ones going on right now first. If Eastern Michigan beats Wyoming, that could arguably break the MWC/MAC deadlock. TCU vs. SMU is another chance of an upset by the AAC over the Big XII. Similar to TCU, Boise St. is only a story if they lose, but it’s still good to get a road Pac-12 win even if it is against Oregon St. Central Michigan is another G5 (meaning not in the Power-5 of ACC, Big XII, Big Ten, Pac-12, and SEC) team on the road that should probably win, at Virginia in their case. Another game in the state of Virginia is East Carolina against Virginia Tech. The Pirates were able to beat North Carolina St. but were not so lucky against South Carolina. The Hokies have a chance to rehabilitate somewhat from their previous non-conference game against Tennessee. BYU will play its fourth Power-5 opponent, this time traveling to West Virginia. The Cougars beat Arizona before losing to Utah and UCLA in close games. I’ll be very interested in the Wisconsin-Michigan St. game, the big game between two ranked teams. 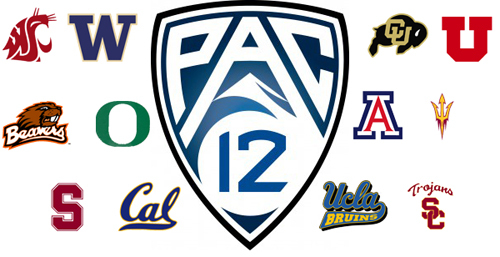 The Pac-12 has a couple of big games involving Southern California teams. USC is playing Utah right now, and UCLA plays Stanford tomorrow Of course Stanford beat USC last week, so they’re trying to sweep L.A. I also wanted to mention there is a big game in the ACC Coastal between North Carolina and Pitt in conference openers for both. Before I begin, I wanted to give the link again to the LSU-Auburn Rivalry Blog. Once again, rumors of the demise of the SEC have been greatly exaggerated. The conference has a total of three losses in intereconference play. This is one fewer than the Big XII, which has four fewer teams. No other conference has fewer than six losses. Also, the Big XII has half the number of wins over other Power 5 conferences. The only wins have been TCU’s close win over Minnesota in Week 1 and Oklahoma’s overtime win over Tennessee on Saturday. The SEC has wins over Wisconsin, Arizona St., Louisville, and North Carolina. On the other hand, it is a plus for the Big XII that three of the losses were by the apparently two worst teams, Iowa St. and Kansas. The three SEC losses were by teams with a combined conference record of 5-19 last season though, so that’s not a huge disparity. The opponents had a 64% combined overall winning percentage. So I don’t think that even though Western Kentucky and Toledo aren’t in Power 5 conferences that somehow that reflects horribly upon the whole conference when they each beat a team which finished last in an SEC division last season. I have a couple of comments about the Toledo game below. 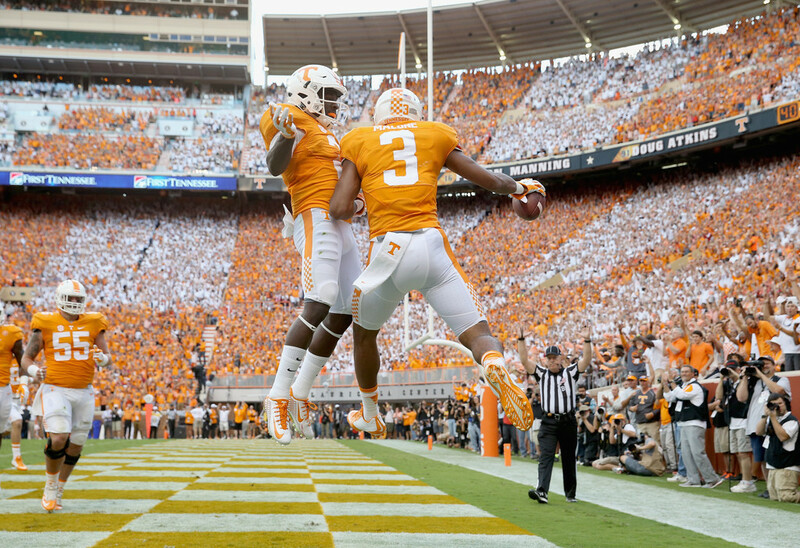 The Vols celebrated early, but Tennessee’s 4th-quarter collapse gives the Big XII #1 for the week. I didn’t address this in my rankings blog, because I had barely looked at the polls when I wrote it. This is sort of along the same theme of the SEC detractors being a bit off. This may just be pro-Notre Dame bias, so the affect upon an SEC team might be incidental, but it’s ridiculous to me to not only have Notre Dame in the top 10 to start with but to move them up after they trailed Virginia in the final two minutes. Then Auburn, which also won a close game over a team it should have been expected to beat comfortably, fell 12 spots in the AP poll. How does that make any sense? Granted, I moved Auburn out of my top 25, but I only had them 17th last week and 20th to start the season, so the game really only made a few small difference in my opinion of the Plainsmen. Likewise, I moved Notre Dame down slightly. One difference between the two for me is that Louisville lost to Houston, which significantly devalues Auburn’s win over Louisville. That game was also closer than it should have been in hindsight. The polls typically rely on how good the opponent SEEMED to be at the time and never give any consideration to prior games again. Another thing is that I value overtime wins less than wins in regulation; but this does not seem to be considered very often, at least not unless it was a controversial game everyone saw like LSU/Alabama last year. But for one to move up a spot and the other to fall 12 spots in one poll and 8 spots in the other means they’re not playing by the same rules. Part of it might have been the difference between FBS and FCS, but Jacksonville St. has given a number of good teams close games and even beat Ole Miss in 2010. On the other hand, since 2009, Virginia has as many losses to FCS teams as bowl appearances (1). I mention prior seasons because last week isn’t much basis to judge; but regardless, there is no reason to assume Virginia must be that much better to justify such different treatment. It might seem like a silly thing to say, but Arkansas was pretty dominant until it came time to score thoughout the game. They reached the red zone five times and only had three points to show for it. It won’t happen very often that one team out-gains the other team 515-318 and loses 16-12. The Hogs only turned the ball over once, so that wasn’t the problem either. Arky also had possession for more than 15 minutes more than the Rockets did and had twice as many first downs. The key was the red zone offense, which I mentioned above. It’s like if a basketball team can run its offense perfectly fine and get open looks but just has a terrible night of shooting. As Les Miles would say, Arkansas is still a capable team that has a want to compete, but if you’re playing an opponent that went 7-1 in its conference the season before, they might just take advantage when you’re that incapable of scoring points at key times. Toledo’s one conference loss last season was to Northern Illinois, which Arkansas destroyed last year… on the scoreboard. I thought it would be interesting to compare the stats of that game. The Hogs only out-gained the Huskies 427-303. Instead of having 15 more first downs, they only had 7 more first downs. Instead of having a 15-minute edge in time of possession, they had only a 9-minute edge. Final score: Arkansas 52, Northern Illinois 14. Amazing how a blowout win can compare statistically to a loss in this way. I mentioned #1 and #2, but the bottom two were also pretty easy. The Mountain West went winless this week, and the Sun Belt beat its first FBS opponent of the season when Georgia Southern beat Western Michigan. So now we just have to rank the remaining 6 conferences. The Big Ten did well despite not finishing with a good record last week. The record improved this week, but the conference suffered two losses that don’t look so good. Maryland made a bowl game last year, so they shouldn’t be losing to Bowling Green even though that’s a MAC team that often makes bowl games (they’re not called “home for the holidays Green”). Also, Rutgers losing to Washington St. at home is embarrassing. If a team from the other coast comes to visit after they lose to an FCS opponent, you should win. Rutgers hardly appears to be a conference bottom-dweller either. The two Michigan teams beat the two Oregon teams though, so that’s a positive. Speaking of the teams from Oregon, their conference (the Pac-12) didn’t really do anything to be proud of apart from one of their worst teams getting that win I mentioned in Piscataway. So I rate the Big Ten slightly better again. The AAC (American) knocked off Louisville (which lost to Houston) and Kansas, which counts for two more Power 5 wins than the ACC has all season. Added to the Temple win over Penn St. in Week 1, this brings the total to three. The MAC also had a good week with the wins over Arkansas and Maryland. Marshall wasn’t a bad win either. Even Eastern Michigan, typically one of the worst MAC teams, got a win over Wyoming. Losing to Colorado and Georgia Southern caused them to lose out to the AAC though. The ACC didn’t do much to help its cause. Louisville lost, like I just mentioned. I’ll still give them the edge for the week over the CUSA since at least none of their teams lost to Indiana and their champion from last season didn’t lose to Ohio U. Below are the weekly and overall rankings. The MWC might not seem logical on first blush, but #4 through #9 were not that far apart in week 1, so the MWC was really hurt in week 2. It was close for overall #8, but the CUSA got the edge basically for not having Wyoming, which has lost to Eastern Michigan and North Dakota. Kenny Hilliard after giving LSU its only lead of the game. I thought SEC teams didn’t travel to PAC-10/12 teams, hmm. LSU is expected to go to back to Arizona St. some time, but the date keeps getting pushed back. Right now, it’s slated for 2022, but who knows? The Tigers are now actually supposed to travel to UCLA before then. I don’t know if I’m even ready to count on next season just yet. As of right now, it seems LSU will be hosting McNeese to open next season (they travel to Syracuse later next season for the only non-home non-conference game) and will then have a rematch with Wisconsin to open 2016, this time in Green Bay. So Wisconsin may end LSU’s streaks after all. LSU also won its record 46th straight non conference regular-season game. I don’t want to count on it of course, but if there isn’t a non-conference loss this regular season or next, the streak would be 53 going into that 2016 opener in Green Bay. I mentioned more about that streak after the Tigers broke the record a couple years ago. As I expected, LSU didn’t exactly have an easy time of things this year, but I was surprised by a couple of things. I didn’t expect Wisconsin to get an early touchdown as a result of a defensive line mistake. Credit does go to the blockers and running backs for exploiting it of course, but I mean from the perspective of LSU. Also, there were some questionable defensive play calls. For instance, one play Wisconsin lined up with extra blockers to the left and no one filled the gaps. I guess they were really convinced the runner would go to the end. At least they didn’t get a first done one that drive though. It will take some time to have four solid quarters where the play calling and execution syncs up better. That’s why I’m so relieved LSU got past this game and will have what should be some somewhat comfortable home games to iron out those issues. On offense, I was happy with the backs and the blockers, but Jennings still has some maturing to do. He hasn’t learned that if you don’t have a throw and it’s third down with everyone expecting a pass, you can run, particularly with the match-up advantage the Tigers had against the Badger defensive line. It doesn’t have to be part of the play call. Also, if there are no good downfield options and you’re outside the tackles, throw the ball to a buddy or your favorite coach on the sidelines. Otherwise, I wasn’t too terribly unhappy with anything except for the 19-yard punt. I’ll explain a little how the offensive strategy improved in the second half though. I expected the final score to be more like 21-17, but that’s exactly what it would have been without the first touchdowns by either team. The first LSU touchdown was for 80 yards against the Wisconsin corner who started for the first time, so it was less surprising than the one LSU gave up. It reminded me of the Jennings touchdown throw that beat Arkansas last year (and that was before I realized it was the same receiver). He’s a reliable technical passer when he has time and is looking in the right place. The easy narrative is Wisconsin went up 24-7, then LSU shut them down going forward; but I think there was a clear beginning, middle and end. 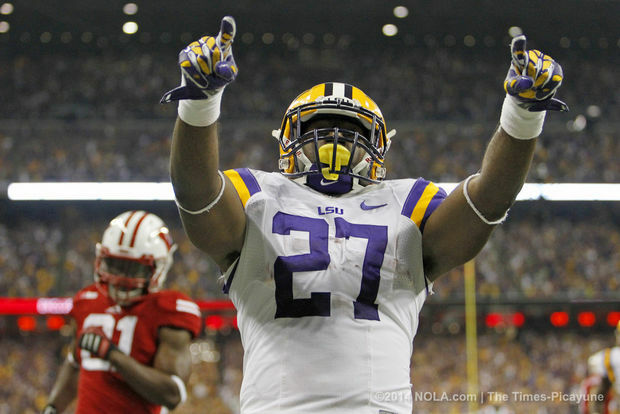 LSU messed up a couple times, and those mistakes were the key to Wisconsin’s 10-0 early lead. Then it was a more even game. There was an exchange of touchdowns before the half and the Wisconsin touchdown was the only score in about a 23-minute stretch of the game. It so happened the following score was by Wisconsin, but that was answered by two field goals in the next 10 minutes. So in the 35 minutes between Wisconsin going up 10-0 and the start of the fourth quarter, Wisconsin only won that segment, 14-13. Then LSU took care of business in the fourth quarter, 15-0. The defensive dominance did start midway through the third quarter though. The Badgers’ last five drives were for a total of 42 yards. That includes a 23-yard drive after LSU took the lead, but that one took 8 plays. That’s less than three yards per play. LSU, on the other hand, couldn’t maintain a drive early on. The Tigers got first downs (including the 80-yard touchdown) in five drives of their nine in the first half but never a second (except for the one that resulted from a penalty immediately following an offensive first down). The fake punt was a turning point but not just some type of psychological boost. Apart from the first drive, the singular first downs in the first half had come from passing on the first play of the possession. The fake punt was the fourth running play in a row, which opened up the passing game. So Wisconsin didn’t think the sky was falling because something went well for LSU, but they were starting to expect a run, and Jennings was allowed room to manœuver. While passing didn’t open up the running much, the reverse seems to have happened. LSU kept up this strategy in the second half and until they started to run out the clock, they kept tending to run, but they also started passing better when there was less pressure to do so. Thankfully, the necessary adjustments were made early enough. Otherwise, it might have been too late to start trying to commit to a running game. I always wonder when I see a quarterback go 9-for-20-something and a running back average six yards per carry why there weren’t a lot more runs by that person. I guess they wanted to give Jennings a chance to show what he could do, but at least get the lead first. LSU exploited the one member of the secondary they needed to exploit on the 80-yard play but didn’t do nearly enough to exploit the questionable front 7 of Wisconsin until the second half. I don’t fault the coaches as much for giving other running backs a chance. Wisconsin was smart to give Reggie Love a chance on that first touchdown, for instance, although one could argue they maybe should have tried giving it to him again. The rest of the running-back carries were almost evenly split among two other players. Love got no further carries. Most of you need no explanation on this point, but it also does wonders for your defense when you run the ball. If you get first downs, it often takes two or three plays. So even if it’s an unsuccessful drive, you might have ten plays for two first downs, whereas an unsuccessful passing possession with two first downs could be just six plays. Also, running plays typically take longer to develop. This allows opposing defenses to be worn down while allowing your own defense a breather. Jennings was only 5/13 in the first half, so 4/8 in the second was an improvement. 8/16 for the game would have meant one fewer completion against 5 fewer incompletions, i.e., opportunities for making or contributing to first downs. LSU ended up with 11.2 yards per pass, but apart from the 80-yard pass, there were just over 3 yards per pass in the first half. Also, LSU won time of possession in the second half by almost eight minutes. That stat doesn’t always mean much, but it does when both offense’s strong suits are their running backs and lines. Wisconsin had an even worse time of things trying to throw the ball, averaging only 2.1 yards per pass the entire game. LSU isn’t particularly relevant to this discussion, but I still thought it was a cool picture to go with the SEC logo. It was taken after LSU went 9-0 against the SEC in calendar year 2011. I’m not one to argue that you can tell anything by conference records. If one conference has 4 teams with one loss or fewer and another has none, that gives you absolutely no information about which conference is strongest. So we have to look at non-conference records. Every week with my computer poll, I publish a page called “Conferences & Divisions“. This is an attempt to rank the conferences according to top 10/25/40 membership in my unbiased computer poll. What I’m going to look at here, however, is how the conference as a whole has fared against other conferences. The next section is how I arrived at #1; the discussions go a lot more quickly (usually with less depth) after that. The best conference record against other conferences, at least by my tally that I keep throughout the year, is the SEC’s at 39-6. Admittedly, that includes 10 FCS wins, which is tied for second-most with the MAC and behind the ACC. Consider that the Pac-12, for instance, has played 10 games against FCS schools, but one was a loss. The ACC, SEC, and Big Ten are the only conferences that are perfect against the FCS this year. Keep in mind that the ACC and SEC each have two more teams than the Big Ten(+2) does. The Big Ten has 9 wins over FCS opponents. If we take those games completely out, the Pac-12 is slightly better with an 80.8% winning percentage as compared to 80.6%. I think the SEC should still be considered better, all things being equal, due to the lack of an FCS loss. But all things aren’t equal, so we can explore further. I have Notre Dame as a stand-alone category because they used to have special provisions in the BCS formula as one of the original signatories. Also, I think a program that played in the national championship game last season should qualify for that category anyway. Anyway, other than that one-team category, the lowest number of losses overall (6 apiece) belong to the SEC and Pac-12. As mentioned, the Pac-12 has the one FCS loss (Oregon St. to Eastern Washington). Cal lost to Northwestern and Ohio St., Notre Dame beat Arizona St. and USC, and Washington St. lost to Auburn. 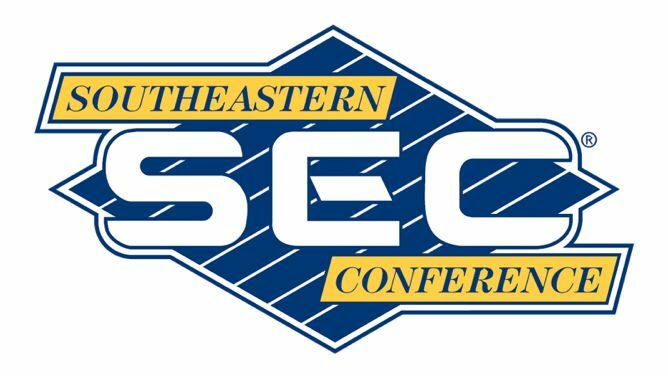 The SEC has nonconference losses by lower teams to Rutgers (by Arkansas), Louisville (by Kentucky), and Western Kentucky (Kentucky again). Western Kentucky is not a good team, but I think they might beat Eastern Washington. Even if they wouldn’t, I think it’s more understandable for possibly the worst SEC team (the Wildcats are winless in conference) to lose such a game. Western Kentucky only has two more losses than Eastern Washington does. In contrast with Kentucky, Oregon St. is 4-2 in the Pac-12. I don’t think there is anything to take away from Tennessee losing to Oregon or Washington St. losing to Auburn. Georgia lost to Clemson, and Florida lost to Miami, but Georgia and Florida are probably the 6th and 7th SEC teams right now. That was against the ACC’s #2 and #3, and the ACC is having a relatively strong year, at least at the top. I guess with Notre Dame’s loss to Michigan, you can be a little more critical of the two Pac-12 teams for losing to the Irish, but Arizona St. is the only one where it looks a little bad so far. USC is more the equivalent of Florida and Georgia in terms of in-conference strength. The SEC is 8-5 against BCS conferences (+Notre Dame), and the Pac-12 is 6-5 against that same group. The AAC is only barely a BCS conference, so if you take that out, the SEC’s 7-4 is still better than 6-5. So I think the SEC is fairly #1 and the Pac-12 is fairly #2. Both are over 80% against FBS, and no other conference is over 80% even if you include all opponents including FCS. I’m going with the ACC next. Even though their winning percentage dips to 68% when the FCS wins are taken out, they have fairly big wins. Among the BCS, the Big Ten has beaten Notre Dame (good win, don’t get me wrong), Iowa St., Cal twice, and Syracuse twice, along with a few insignificant AAC teams. The Big XII only has Notre Dame and Mississippi St., along with two wins over SMU. I think based on Michigan’s position in the Big Ten, the Big Ten’s win over Notre Dame is more significant. Cincinnati and Syracuse twice is better than SMU twice. The bad losses of Rice and Navy are roughly equal, but the Big XII has the two FCS losses. The AAC is the sixth conference at least, so it shouldn’t be too painful to watch its champion in a BCS bowl. It has a better Division I and FBS record than the Sun Belt, the surprising #7. The Sun Belt is very balanced though, and notably has no teams in my computer ratings above ULL at #49. If I counted Notre Dame as part of the independents, that would make the independents 6th, but apart from playing Navy, the Irish aren’t really in the loop with the other independents, who are now three Western teams along, two service academies, and Old Dominion, which has hardly played any other FBS teams anyway. So I think it makes more sense to just leave them out of that group. Anyway, without Notre Dame, I would put them at #8. BYU has been the only impressive team (despite the baffling loss to Virginia), but Navy’s win over Indiana was another plus. The MAC and the Mountain West are pretty even. The MAC has a few more wins over BCS teams, but really they each have one meaningful win: Northern Illinois over Iowa and Fresno St. over Rutgers. Against the FBS, the MWC has won 25%, the MAC has won 24.4%. I’m just going to call that a tie. The CUSA was pretty similar to those two, but I put them last because of some ugly games. Also, they had losing records against the MAC, Mountain West, and Sun Belt. One of their better teams by record is Tulane, which lost to South Alabama. The one major win was East Carolina over North Carolina, which isn’t impressive. There is a loss to Kansas and a loss to Arkansas, the two teams only having 3 FBS wins between them all season. There are also bad losses to New Mexico, Colorado St., Troy, Army, and Bethune-Cookman. Alabama, Auburn, Central Florida, College Football, Florida St., Michigan, Missouri, Ohio St., Oklahoma St., Oregon St. Same voters as last week: two LSU fans (myself included), one Texas fan, one Oklahoma fan, one Michigan fan, and one Notre Dame fan. Once again, Texas’s only votes came from the Big X(II) participants, and it was enough to sneak them into the top 25, although they’re tied with Michigan St. The first unranked team, Louisville, received votes from four voters. This week was the first time I’ve gotten ties on ballots, and I got them from two people. As far as I know, the AP still allows it, so I’m allowing it. Auburn jumped 12 spots, but they still didn’t take over as the top one-loss team. That honor goes to Stanford. Texas Tech gained 5 spots but not nearly enough to compete with most of the undefeateds. The Red Raiders will face four of the current top 25, so the opportunities to advance should be there. Once again, we had a change of the top 5 with the last ballot. Ohio St. edged Missouri for #4. In another regional eccentricity, the two Midwestern voters were the only two to place Nebraska higher than 23rd. First, I wanted to mention that Missouri did come first in my computers, but I’m keeping Alabama #1 for now. I don’t like to change #1 on my personal list lightly. However, if after Alabama plays LSU on November 9, Missouri or any other team is ahead, I will list that team as #1. Apart from the switch between 1 and 2, the remainder of my list is solely based upon the results of my formula. Speaking of LSU, they not only fell because of losing but also because that Georgia loss is hurting them more and more every week. I know the Tigers played a better Georgia team, but there is no way to comb through 126 teams and make adequate adjustments for injuries and so forth, so I don’t do it in any case. Auburn’s win did keep LSU from falling farther, but LSU has a lean couple of weeks coming up with Furman, followed by a bye. A loss to Alabama, followed by another bye, could dig the hole even deeper. Auburn, which took LSU’s place in the top 7, wasn’t really hurt by the other SEC upsets since they’ve played both LSU and Ole Miss and have not played Georgia or Florida. Auburn probably would have done a little better with LSU winning though. Also, Georgia’s loss will make it harder for the Plainsmen to move up as the season goes on. Texas Tech also jumped up 8 spots, mostly due to weak opponents or losses by teams ahead of them. The teams are closer together toward the middle of the poll, so small deviations can make a big difference. Another SEC team fell out of the top 25 and two more nearly did, but the conference as a whole is still pretty dominant when the top teams are compared (see here). With the addition of Ole Miss, there are now nine SEC teams in the top 40 and three more in the top 66. Vanderbilt and Tennessee were not in that latter group last week. If you think this is too weighted toward the SEC, keep in mind that some SEC strengths of schedule will decline in the next couple of weeks as those of other conferences will improve. Most other major teams do no play FCS opponents at this point, but several SEC teams do. Texas A&M and Auburn will not play FCS (I-AA) opponents (again), but they will play UTEP and FAU, respectively. I did tweak the formula slightly to make sure the better FCS teams don’t count as horrible losses. Oregon St., for instance, would not be in the top 25 had I not made that change. Kansas St. was also being unduly penalized. Both losses are treated about the same as losing to TCU, just for reference. If I start trying to explain the numbers, almost everyone will get bored, so I’ll just leave it at that. I have more detailed statistical information here if you are interested. If an FCS team has a substantial number of losses (or losing percentage) in its sub-division, the rating decreases fairly quickly, so the change doesn’t benefit all teams who lost such games. FCS team ratings are just more of a bell curve now, which I think more accurately reflects the quality of the FCS. That’s the only part I’ve tinkered with in the last few years. Just a random observation and then I’ll have a couple of detailed topics: Arkansas plays four SEC teams in the preseason top 10 in consecutive weeks, beginning September 28. All four won over the weekend, as did the Razorbacks. Kentucky also has a similar string of opponents beginning September 14, but one of the preseason top-10 opponents is Louisville. Oregon St. became the third ranked team ever and first since 2010 to lose to an FCS (formerly I-AA) opponent. The other two were Virginia Tech (to James Madison) and Michigan (to Appalachian St. in 2007). By my count, FCS programs went 8-21 against FBS (formerly I-A) teams, a better winning percentage than the MAC, MWC, and Independents had against FBS teams in Week 1. Of those, only the MAC had a better winning percentage against Division I as a whole. The Big Ten schools are in the process of eliminating FCS schools from their schedules. The Big Ten has not lost to any so far, but the Big XII and AAC (the successor to the Big East) lost two such games apiece. The conference should probably re-think that, especially since North Dakota St. and Northern Iowa (and much of the rest of the current Missouri Valley Conference) often fields teams that are more competitive than MAC opponents that may be chosen instead. Also, it doesn’t hurt that Northern Iowa has played interesting in-state games against Iowa and Iowa St. (including this year, when it beat the Cyclones) in recent reasons. Minnesota has struggled against Dakota teams, nearly losing to South Dakota St. in 2009 and then losing to South Dakota in 2010 and to North Dakota St. in 2011. Maybe the Big Ten should place a limit on how far away the FCS opponent can come from instead. Games of regional interest against competitive FCS programs should definitely continue. North Dakota St.–which came from behind, 21-7, to beat Kansas St.–has beaten an FBS school for the fourth consecutive season. Three of the four were against opponents in auto-bid BCS conferences. The Bison move to 7-3 against FBS opponents in the last 10 years. Before 10 years ago, they weren’t losing to FBS schools; instead they were competing in Division II. Don’t forget FBS schools often pay for the right to play these FCS opponents. ESPN’s Darren Rovell provided the numbers for two of the games. Kansas State paid North Dakota State $350,000 to play Friday’s game. NDSU paid for its coach’s salary and then some. Craig Bohl has a base salary of $206,000. The UConn Huskies paid Towson $275,000 to beat them Thursday night. Two of the FCS winners over FBS teams this weekend have played LSU in recent seasons. The Tigers defeated Towson last year and McNeese St. in 2010. Towson beat UConn, 33-18, and McNeese St. beat South Florida, 53-21. Hard to believe UConn was in a BCS bowl in 2010, and in 2007, South Florida was #2 in the BCS standings. At first blush, it might appear that the LSU defense struggled with the loss of talent (depending on whom you ask, they had either 4 or 5 returning starters on defense), but when you look closer, not really. The only touchdown allowed in the first half was allowed by the special teams. The only other TCU scoring drive in the first half was a field goal. The defense did technically allow two touchdown drives in the second half, but one of those started at the LSU 6 after a fumble by the LSU running back. There were definitely some things the defense did wrong leading up to the other touchdown for the Horned Frogs, but at one point it actually seemed to have a stop before a penalty was called for roughing the passer on third down. After a bad punt, TCU also got a second-half field goal from 39 yards out after only a 26-yard drive. The defense also came up with an interception. Other than the one turnover, the offense did a fairly good job overall. Mettenberger was very on-target, and it’s really an injustice to him that only 50% of his passes were caught. Some of the passes were thrown to perfection, allowing receivers to catch the ball in stride and evade even very good coverage. At least a couple such balls hit receivers in the hands and were not caught. He did linger in the pocket at times, but I’d prefer that to risking an interception. I think there were missed blocking assignments and things of that nature that contributed to problems and will work themselves out as the season progresses. Mettenberger showed some good scrambling ability, but he’s not great at running or throwing on the run. Like the receivers, the running backs were a bit of a mixed bag. Odell Beckham, LSU’s top receiver on the night in terms of yardage, also had one of the longer runs on an end-around for 17 yards. Alfred Blue (who committed the turnover) was solid but not spectacular, carrying the ball 19 times for 89 yards. Terrence Magee, who was only credited with one rushing attempt and one reception last season, showed the ability to accelerate on a 52-yard touchdown scamper (the blocking on that play helped make up for some backfield errors) but only gained 43 yards combined in his other 12 carries. Jeremy Hill is serving a (indeterminate) suspension for punching a man outside of a bar, but it’s nice to know there are at least two able backs. Kenny Hilliard showed flashes of brilliance in the past as well, but he only had 4 carries for 8 yards on Saturday. Aside from struggles with TCU kickoff returns (even apart from the 100-yard touchdown, the Frogs gained 69 yards in the other four returns) and the one bad punt, the special teams did well. There were two other punts, one of 48 yards that was fair caught at midfield and another of 43 yards that went out of bounds at the 9 yard line. There were no punt returns for the Tigers or Horned Frogs. The three LSU field goals were all of under 30 yards (which says we could use some improvement in the red zone), but all of the kicks were free from any drama from what I could tell. Odell Beckham did some damage of his own on the LSU kick returns, returning 4 kickoffs for a total of 136 yards. Some other odds and ends. LSU was 13/19 on third downs compared to 7/13 for TCU. The Tigers out-gained the Horned Frogs, 448-259. TCU was penalized 9 times for 55 yards, and LSU was penalized 7 times for 42 yards. The Tigers had twice as many first downs, 26-13, one fewer turnover, and almost exactly 12 more minutes in time of possession. The Tigers have won 42 consecutive non-conference regular-season games since losing the opener of the 2002 season at Virginia Tech. I went over the highlights here. This is also the first time in LSU history that the team has won 11 consecutive season openers. For top 10 reasoning, go here. 11	Boise St.	19	– Chris Petersen is 51-2 with a returning quarterback. The Broncos don’t have an impressive schedule at all. I don’t factor that in though, or I would be ranking them even higher. They return 10 other starters as well, mostly on offense, so the defense should have some openings for the likes of Washington to exploit. That is why BSU is not in the top 10. 12	Texas	—	– Even with 19 returning starters, it was hard to put the Longhorns any higher based on the last couple of seasons. On defense, some of the returning starters apparently aren’t even good enough to start again. Defensive backs should be strong though, and there are no glaring weaknesses on offense. 13	Florida	6	– The Gators have 10 returning starters from a team that at least for most of last season greatly exceeded expectations. The running game will be a major question mark, but another solid defense can be expected. They could be something like LSU was in 2010 when there wasn’t much of a passing game either (at least not reliably), but other areas were strong enough that the team still finished #8. With the right combination of wins, Florida could end up representing the East after all. The downside possibility is that the Gators could finish around .500 in conference and maybe even lose to Florida St.
14	Oklahoma	15	– The Sooners need to replace a quarterback, but the 7 offensive returning starters should help out. There will also be considerable depth at receiver that is not reflected in that number. Run defense and pass rush can be very suspect being that the team had trouble in this area last season and does not return anyone on the defensive line. 15	Oregon St.	24	– The Beavers return 15 starters from a 9-4 team last year. They always seem to be a team that can knock off a top team in conference even though this OSU rarely has the talent to win the conference, which should be tilted toward the North once again. They should be able to do better with running the ball, but throwing it may be more suspect. The defense should be solid overall, but there will be some holes to fill on the line. 16	USC	—	– Staying with the Pac-12 (and this is a team that will have to travel to Corvallis), I don’t quite understand why so many are overlooking the Trojans. They were a top-3 (if not top 1) pick going into last year. While calling last year a disappointment is an understatement, much of the team has another chance at it, and they’re certainly not worse than a year ago. Although there is some chatter about Arizona St. potentially winning the South, there are five pretty win-able divisional games for USC, which also does not face Oregon. They will have a new QB, but I was never impressed by Barkley anyway. I don’t expect anything like 12-1, but the 2003 team did pretty well with a first-year quarterback, as did the 2008 team in Mark Sanchez’s only full season. 17	Notre Dame	2	– All of the easily-recognizable names from last year are gone, but 13 returning starters were enough to put the Irish a good number of spots into the top 25. The pressure will be on Brian Kelly to show that he can keep the team together despite some significant challenges and that last year wasn’t just a combination of lucky breaks. Like last season, the defense should be good enough to keep the Irish in games even if the offense doesn’t perform. 18	TCU	—	– Lest anyone think that I’m looking past LSU’s first opponent coming up in a few days… The Horned Frogs return almost the entire defense from last year and 6 returning starters on offense. There could be a quarterback controversy and the running game will be an unknown element, but the rest of the offense seems to be solid. 19	Nebraska	18	– Taylor Martinez is one of 12 returning starters on what momentarily looked like a sure Rose Bowl team last season. He will have a running back and a couple returning receivers to accompany him. Sometimes the defense just hasn’t shown up, so it may not be entirely bad that only 5 starters return. 20	Florida St.	12	– It’s not just THAT the Noles only have 10 returning starters, it’s where they are. Only two will be throwing targets, none in the backfield. On defense, the only returning starter outside of the secondary is a single middle linebacker. FSU has five games to get off its feet before traveling to Clemson, so despite the problems, I would not expect a loss before then. 21	Michigan St.	—	– Despite 6 total losses last season, the only team that beat the Spartans by more than 4 points went to the BCS Championship game. A little bit of maturity might be the only missing ingredient. Eight starters return on offense, where MSU needs to focus on finding running backs. A couple of players on the defensive line will need to be replaced, but the defense may challenge for best in the Big Ten. They may well turn out to be a bit better than this, but I believe in making a team like this prove it. 22	Ole Miss	—	– This is the other extreme from Florida St.: 20 starters return to a team that finished barely above .500 last season (although playing in the SEC West was a good reason it didn’t have a better record). The defense wasn’t up to par last season, but that is the side with more returning starters. Other than two kickers, the Rebels only need to replace a tight end, an offensive guard, and a middle linebacker as starters. 23	N’western	20	– Both lines will have significant new starters, but 15 starters return from a 10-win team last year. Like Ole Miss, the defense wasn’t always reliable, especially not in the secondary, but we’re not talking about BCS-bowl teams at this point, so there can be such weaknesses. 24	Wisconsin	—	– The Badgers finished strong and won the Big Ten, but not before a lot of losses that would have normally made that impossible. So I’m not picking them particularly high despite returning 14 starters from that team. The offense should be pretty similar, if it can find a good running back; but beyond the line, there could be trouble on defense, where only 6 starters return. 25	Oklahoma St.	—	– The weakness with the Cowboys seems to be the running game, although a quarterback rotation can also be problematic. Three starters on the offensive line need to be replaced, and there is no returning starter at running back. Both sides of the ball return 7 starters, but on defense, the players lost from last year seem a lot more balanced. Nos. 3-6 include most people’s top two as well as South Carolina and West Virginia, who I feel have legitimately earned the most so far. Then the next three are Florida, Oregon St., and Kansas St. They weren’t preseason headliners, but you can’t say too much critical of their positions just looking at the resumes. Then Stanford has had one of the best schedules so far with only one loss. Even San Jose St. has done well in other games. After the top 10, there are too many teams that are only as high as they are because they don’t have any losses. A 1-loss team later in the year is more likely to be ahead of an undefeated Louisiana Tech or Ohio because they’ll have a lot more wins with which to overcome those losses. I’m just going to throw a simple mathematical example out there if you’re interested. For instance, if you get one point for beating a good team and lose two points for losing to a good team and then get half a point for beating a poor team, this is what it would look like. 5-0 against poor teams = 2.5; 4-1 against good teams = 2. But the same calculation right before the bowls: 12-0 against poor teams = 6; 11-1 against good teams = 9. The high SEC teams aren’t a result of some bias built into my formula. It’s pretty consistent all around. Kenneth Massey, one of the BCS computer rankers, compiles a list of the major publications as well as just about every unbiased top-to-bottom computer ranking and based on his averages of the rankings, the numbers are as follows: 3 in the top 3, 6 in the top 14, and 7 in the top 19. That said, I’m willing to admit that the bottom SEC teams aren’t as good as they have been in past seasons. I remember one year Ole Miss was winless in the SEC but undefeated out of conference; but teams like Kentucky, Vanderbilt, Ole Miss, and even Arkansas all have non-conference losses already. Eighth in the SEC on the list mentioned above is Tennessee at #45, followed by Missouri at #50. But the lower teams aren’t terrible either, as Kentucky is last in the SEC but #75 in the country. Every other conference has at least one team significantly lower than that, and all except the Big XII (with only Kansas lower, at #105) have multiple teams lower than that. My rankings are actually less generous toward the lower SEC teams than these sort of aggregate rankings are. With at least the better SEC teams as good as they are, and most of its easy weeks out of the way (having had a bye week and having played Western Kentucky, Arkansas, Florida Atlantic, and Ole Miss), Alabama will have plenty of chances to move up. Unlike with the human polls, there is no deference to what a team’s ranking was the week before. So if for instance, Alabama were to beat South Carolina this week, they could jump over several other teams who won games against lesser competition. In actuality, LSU plays South Carolina this week (and I’m more nervous about this than I was about the BCS championship game), and Alabama won’t play South Carolina (if at all this season) until the SEC Championship game. Alabama does still have divisional games against LSU, Texas A&M, and Mississippi St. The Tide’s inter-divisional slate (consisting of Tennessee and Missouri) isn’t exactly impressive, but they are both decent opportunities for points. What could happen is Alabama could be #1 after going through the divisional games mentioned above and then fall behind after playing Western Carolina and Auburn, but as mentioned, the SEC championship game should help out a good bit. Last season, Alabama was stuck at #3 because it did not have the benefit of a ninth conference game, so it was FCS opponent, followed by Auburn, followed by no one. SEC champions, on the other hand, have fared quite well in my rankings, both before and after I made a change to the formula, but I’ll mention the results since the change. Florida was #2 going into the BCS championship in 2008, moving into #1 after winning, but that team had a loss (also, this was before I compiled the strength of schedule myself). 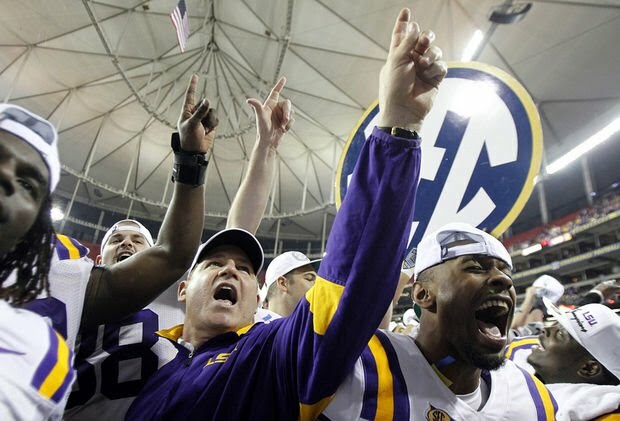 Alabama was #1 in 2009, Auburn was #1 in 2010, and LSU was #1 last year. LSU was such a strong #1 that even the loss didn’t knock them out of #1, and Auburn may have obtained the same result with a loss in the 2010 championship. Texas would have surpassed Bama with a win over them in 2009, however. The other two undefeated top-ten SEC teams should be fine as well. Mississippi St. isn’t realistically going to finish undefeated anyway, but if they did, that’s the only SEC team I could see having problems if they did so. I’ll end with a couple of general comments. Ohio finished in the top 25 published on my ratings site, but since I had to make some numerical adjustments just to give them a good enough schedule to be rated, I thought it best to put the teams that actually earned all their points higher on here. There was more turnover in teams than I expected. This was partly due to a relatively eventful week (this week looks like a snooze, by the way). But I would note that none of the five teams I took out of the rankings last week moved back in with the introduction of computerized ranking. So my moves in an effort to be more objective were correct in those instances. I never claimed to be the best prognosticator–I don’t pay as much attention to things like trends, key athletes, X’s and O’s, and margin of victory, since they don’t factor into my computer ratings–but I actually have done all right when tested this season. Of the picks I’ve made so far this year, I’m 41-9. So while people get grumpy with me, I think I know just a bit of what I’m talking about when I offer other opinions. By the way, while I’m still mystified by LSU’s lack of a running game and general offensive ineffectiveness after the first drive last week, I still feel I was correct in criticizing those who ranked some non-SEC team from the Sunshine State ahead of LSU after Week 5. Before I start, I wanted to remind people of my LSU/Florida rivalry blog. I update these (the records anyway) after each game. The two teams have played one another for about 40 years in a row, and they were the first two teams to win two BCS titles apiece, so it’s been an interesting last 10 years especially. This is the week (the week before the first computer ratings) every year where people try to destroy me and everything I stand for sports-wise because I try to be objective, which is bound to ruffle feathers in small doses, so it’s really big when the whole football world is shaken up if one goes by my rankings. Also, people don’t like that this is a change from going more with the flow in prior weeks. We’ve played nearly half a season, time to take the training wheels off, and if there are scraped knees, spray some antiseptic on it and move on. After all, we’re not talking about shuffleboard, we’re talking about football. I’m going to start with my rankings since I don’t want to confuse people into thinking I’m giving primary importance to what the voters do, but being unhappy with the voters goes all the way back to 1994 for me—and LSU wasn’t even a team at much risk of having a winning record that year—and that’s what got me started with my own rankings system, which started as purely subjective until it got too difficult to be consistent. I still use subjective measures early in this season, but as is typical, I try to phase out things like preseason projections, historical strength of programs, and margin of victory before I turn it over to my arithmetical rankings system. This happens every year, it has nothing to do with LSU having less-than-impressive score lines the past two weeks. So how I did it this year was to basically use a blind resume. I looked at which teams have been beaten and when relevant, I looked at losses. I went ahead and put a couple teams in there with more than one loss, because I couldn’t say any of the unranked undefeated or 1-loss teams fall into the category of having beating someone who at this point seems worth much of anything. I’m going to list the rankings now (after three more sentences). I’m going to go on to give some basic responses to things I’m expecting people to say, and then I’m going to talk about how silly it is to keep moving LSU down. I understand this is mostly just preliminary quibbling with so many teams still undefeated, but if LSU is fortunate enough to win this week and someone complains it was too close, they should be laughed at. If LSU loses, I will just have to be grateful that unless it’s like a Spurrier-era score, we will still look better than USC. People are going to have objections based on things I don’t care about, because they’re things the voters care about. Just know that it will be 100% objective next week. But I will mention a couple particulars. You could tell me you know for a fact USC is going to beat UCLA (or any other currently-ranked team they’re playing) 70-0 this year, and even if I believed you are the one person who is known to have traveled time, I would still say I don’t care because at this point it seems that beating Nebraska and losing to Oregon St. is better than beating Hawaii/Syracuse/Cal and losing to Stanford. None of this is forward-looking at all. Someone may mention that I didn’t rank Arizona when they were undefeated but I am ranking them now and at the same time I moved Oregon down. I still don’t think Arizona is very good (and I doubt Oregon has played another top-60 team), but those teams who happen not to be above Arizona haven’t beaten anyone better in my estimation. A number of teams that I don’t rank ahead of Arizona I still think are better than Arizona. I think Oklahoma or USC would beat Arizona easily. But neither has beaten anyone that you HAVE to be remotely good to beat. Arizona (until there is something to indicate otherwise) had to prove they were at least remotely good to beat Oklahoma St. And the fact that Oklahoma St. lost to Texas doesn’t prove this idea wrong. Oklahoma St. themselves haven’t beaten anyone (unless 3-1 ULL counts), but I was getting pretty desperate there at the end when I added Arizona. I think I made clear why Oregon is going down, but to summarize. I’m taking out margin of victory (which is what impressed people with the Arizona game moreso than the opponent, be honest), and I’m not factoring in either what my projections (or anyone else’s) were for the Ducks preseason or what they are now. That doesn’t leave the Ducks with much. I’ll cover LSU in what is becoming my weekly rant, but Washington looks like a heck of a team based on other games, and other than losing to Mississippi St. somewhat convincingly, Auburn doesn’t seem so bad despite its record. “They don’t have a QB”… yes, I’ve heard it. LSU had probably the best 13-0 start of any team ever last year, and they didn’t have much of one either. No risk of me ranking Auburn #1 or #2 though, so don’t worry about that. Anyway, Washington + Auburn seems a lot better than Arizona (a somewhat nobody) + some serious nobodies. I don’t care if LSU beat both teams by 2 and Oregon won by 149 over Arizona instead of 49. #25 was Baylor, whose best win is over ULM. But none of the other undefeated or one-loss teams have beaten a team that I think has looked as good the first few weeks as ULM has in playing 3 BCS opponents, two on the road. I’m not counting margin of victory for those teams in the top 25, but since ULM is instead being considered as an opponent, I think it is telling that not only did ULM beat Arkansas, but they played Auburn very close in a loss; after all, Auburn didn’t lose convincingly to either Clemson or LSU. I also don’t care about the “eye test”. If it hasn’t translated into doing well on the beat-somebody test, I don’t care. Wins and losses, maybe an opponent’s final score in other games here and there, but that’s it. Next week, no final scores matter even slightly unless it was within a field goal and the home team won (in which case, I think it’s fair in my system to reduce the value of the win 10% and to reduce the value subtracted by the loss 10%). Although I did try, I’m sure I wasn’t completely consistent. I’ve been up for 20 hours straight, and when it got toward the end of the year, I used to spend hours trying to be perfectly fair and take every game into account, but I just can’t anymore. Not until someone pays me. So this is as much work as I’m going to do on this all year, except for next week, but it’s much less intellectually taxing to input numbers than it is to rank teams this way. I usually leave #1 alone, so I didn’t subject Alabama to the same scrutiny, but the win over Michigan plus being 2-0 in the SEC was good enough not to try to find someone else. Another opponent, Western Kentucky, is undefeated apart from the Alabama game . As to last week, I’m not even going to take seriously ranking Florida St. ahead of LSU. This isn’t the 1990s. And Florida St. has done what exactly? Beat Clemson? Even if Clemson is as good as they were last year, Clemson went into the ACC title game after having won one game (by 3 over Wake Forest) out of four. So they beat Va. Tech, which gave them the right to get drubbed in the Orange Bowl, 70-33. Forget that a lot of people were ranking USC ahead of LSU a few weeks ago. What happened? USC lost a conference game on the road (to Stanford, which lost to Washington), and LSU won a conference game on the road. LSU also beat that Washington team. Florida St. easily beat two FCS opponents? That’s a great predictor of being able to beat good teams consistently. This must be why the Seminoles haven’t won the ACC since 2005, a year in which they lost to 5 teams overall. This was despite beating Charleston Southern 62-10 in 2011, beating Samford 59-6 in 2010, and beating Western Carolina 69-0 AND Tennessee-Chattanooga 46-7 in 2008. And in that 5-loss 2005 season, they beat the Citadel, 62-10. Compare that to LSU’s recent experiences. 2010 was a pretty strong team (11-2 after the Cotton Bowl win over Texas A&M), and they only led McNeese St. by 6 after three quarters that year. Prior to that game, the Tigers had already won 4 SEC games. Western Kentucky is an emerging FBS team now, so maybe they’re a cut above McNeese St. , but LSU only led them 14-7 in the third quarter last year. We can also go back to LSU’s 2007 national-championship season when LSU only led Tulane 10-9 at halftime. 2009 wasn’t a great year (9-4 after losing the CapitalOne Bowl to Penn St.), but the Tigers only beat a BAD Louisiana Tech team by 8 after leading by only 4 going into the fourth quarter. LSU has won 41 consecutive non-conference regular-season games (all but a handful since Les came to town), so they know what works. A slow, grinding game gives LSU a sufficient advantage. If you start airing it out and being cute, you might win by a lot or you might help out a team that can’t win on talent alone. As I’ve made clear, I still disagree with the Oregon #2 ranking. Somehow it doesn’t matter that Arizona has lost another game and Washington beat Stanford, because things only matter if they happen before you play the team in question, not after. It probably also won’t matter if we find out Auburn wasn’t so bad after all. LSU allowed 22 points to Towson on Saturday. But of course we can’t go beneath the surface to consider that 13 of those points were scored in the last 10 minutes. LSU probably could have followed the Oregon/Arizona blueprint and scored a few meaningless touchdowns after that point, rather than just one after a 9-play drive. After all, the score that put the Fighting Tigers up by 22 was on a 53-yard pass on the first play of the 4th quarter. And maybe LSU could have done more to put a stop to Towson’s 6-minute touchdown drive, but why? Why not just let a team run out the clock on itself? Slow and steady wins the race for LSU’s offense in such games, but it loses the race for a competitor who takes possession of the ball down 22 in the 4th quarter. I for one am glad the LSU coaching staff didn’t fall into that trap. They worked on things the team needed to work on and finished the game in a respectable manner instead of trying to impress the pollsters. If LSU wins the SEC, it probably won’t matter too much if the voters remember that LSU played that Washington team anyway. Nor will it matter if they were dropped a spot for in the AP poll after declining to run up the score in September. For instance, Mettenberger didn’t need to throw the ball that much. LSU probably could have done just fine making it primarily a rushing attack. LSU may well have done even better considering Mettenberger was sacked 5 times. But the LSU defense succeeded well enough (until the offense came up with the TD to go up 31-9 anyway) that the game wasn’t really threatened by this. (Towson is the Tigers too, so that’s why I’m not being very creative with my subjects.) But he’s a first-year QB; and against Auburn, it showed. He needed to be taken out of his comfort zone against a team that LSU wasn’t too worried about figuring out how to beat.